So you've probably heard people ask you what your macros are, or at least heard someone talking about their own macro intake. What exactly are they talking about??? Macronutrients. These are your carbs, fats, and proteins. The way that these fit together in our diet effect our body composition and in turn what our body looks like. This can all seem overwhelming if you are trying to make your diet match your fitness goals. Today we are going to cover three steps in determining what percentage of your calories you want to come from each macronutrient. There are three main body types. 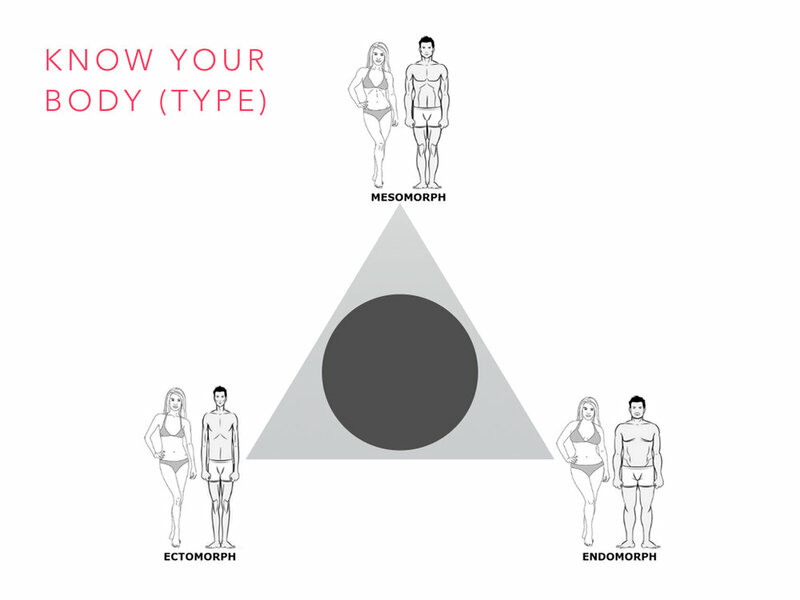 Ectomorph, Mesomorph, and Endomorph. Ectomorph: Naturally thin, naturally lean, and has a more difficult time gaining muscle. Mesomorph: Naturally more muscular, and has a relatively easier time losing fat and gaining muscle. Endomorph: Naturally has a higher body fat percentage, and finds it easier to gain muscle than lose fat. Typically more carbohydrate sensitive. Step 2: Choose your macronutrient percentages based on your body type and activity level. Here are some ranges that you can try and start out at for each body type. Keep in mind that these numbers are NOT exact, and can be played around with as your goals and body composition change. If you are wanting to lose fat, you'll want to go with the higher protein percentage and lower end on the carbs. If you are extremely active on top of your workouts, you'll probably want to go on the higher end for carbs. For those of you trying to gain muscle and size, take your calories up and have your protein and carbs on the higher end of the spectrum. Step 3: Track your food. This is not something you'll have to do forever, and you won't even have to do it everyday if you are meal planning for the week. My Fitness Pal is my favorite for doing this. It's a FREE app that's easy to track, and it does the macro math for you. Track your food for anywhere from one to four weeks, just to get an idea of what you're currently eating. You can make adjustments along the way. If you plan to eat the same thing all week, you can write down what you're wanting to eat, enter it in the app, and see if your numbers look good. You won't have to enter any food that week if you eat just what you wrote down. BOOM! Nutrition is all about knowing your body, and eating the food that your body needs to meet your goals. Know that those goals will change at some point, and be willing to make adjustments as needed. If you think of your food in this way, you'll be able to stick to it long term, not just during the 90 day MELTDOWN challenge!